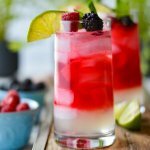 A summertime cocktail that highlights a berry infused white rum. This delightful libation hints a tartness of fresh lime juice and muddled mint leaves. An impressive but simple mixed drink displaying layers of refreshment. Rinse and gently pat dry the blackberries and raspberries. Add the berries to a large airtight glass jar. Pour the rum over the berries to completely cover. Seal and let sit in a dark place for at least 3 days and up to one week. When the rum has been infused to the desired berry flavor, strain the rum with a large metal mesh strainer lined with several layers of cheesecloth. Pull up the four corners of the cheesecloth and twist in order to squeeze out all of the liquid. Discard the fruit. Pour the infused rum into storage bottles by using a funnel. Make sure and seal the bottles so that the rum does not evaporate. Store in a place away from direct sunlight. Muddle the mint leaves with the simple syrup and lime juice in the bottom of a 10 oz highball. Add ice to the top of the glass. Carefully add the Berry Infused Rum to form the middle layer then again carefully add the club soda to form the top layer. Add a slice of lime, raspberry, and blackberry along with mint leaves as a garnishment on top. Choose a good quality rum, white or silver is preferred and make sure it’s at least 80 proof. It doesn’t need to be outrageously expensive or top-shelf but you don’t want the cheap stuff either. Use a large wide-mouth, airtight glass container for the infusion process. Fill the jar with berries, pour the rum to cover them completely and sit in a cool place on the countertop away from direct sunlight. This berry infused process will take anywhere from 3-7 days depending on your taste preference. Shake the container every day to really distribute the beautiful color and flavor of the berries. Strain the rum with a metal mesh strainer lined with several layers of cheesecloth. Let all the liquid drain out and then pull the four corners of the cheesecloth together while twisting to extract every bit of that precious liquor. Use a funnel to pour the Berry Infused Rum into jars that have a tight seal. Store the rum in a cool place out of the direct sunlight. Now comes the FUN part – putting things together for this summery cocktail. Muddling the fresh mint in the bottom of the glass releases an aromatic oil that actually changes the flavor of the drink. Don’t skimp on the leaves. I used about 6-8 large leaves for one drink. Simple Syrup Recipe – 1 cup boiling water and 1 cup sugar. Dissolve sugar in the boiled water. Set aside to cool the syrup.